Parents of the 43 college students, who have been missing in southern Mexico for over six months, have lost all hope of locating their loved ones. Some of them turned to the leader of a drug gang for help, saying the official investigation has failed. A banner hung on Tuesday by a group of parents outside the city of Iguala, where the students disappeared in September, asked alleged Rojos gang leader Santiago Mazari for help. The handwritten sign read: "We ask you to help us locate our sons because this bad government has not been serious with us. To the contrary, it has harmed us with its lies." "We are desperate and wherever the information comes from we will accept it, but it has to be true," Epifanio Alvarez, father of missing student Jorge Alvarez Nava, told AP. The father of missing student, Meliton Ortega, said the invitation to the Rojos' leader was not a move coordinated by the families. The challenge is "to invite people, if they know anything about the students, to come forward with the information," Ortega said. "That is what happened today, more than asking criminal groups for help." The families have little faith in the government and don't subscribe to the official version of events. "It is as if there is no government," the man said. "We even put the phone number of a father there so that whoever has information can call us, pass on a tip or something," Alvarez added. According to the government's account, the students traveled to Iguala on September 26, 2014, to steal buses. Before they left the city, police confronted them under orders from the mayor and opened fire, killing six at the scene. Prosecutors say policemen later turned the students over to members of the Guerreros Unidos gang, which took them to a garbage dump outside Cocula. According to the federal investigation, the students were killed, their bodies burned and the remains tossed into a nearby river. Among over a hundred people arrested and interrogated by authorities were alleged members of Guerreros Unidos, who reportedly said they believed the students had been infiltrated by members of Los Rojos, involved in a bloody turf war with Guerreros Unidos. Contrary to statements from the authorities, an independent investigative report (conducted with help from the Investigative Reporting Program of UC Berkeley and published in Proceso magazine in December) claimed the Federal Police were directly involved in the attack. The college the students attended - the Rural Normal School at Ayotzinapa - is known for its left-wing activism. The probe also asserted that state and federal authorities were tracking the students’ movements on September 26 in real-time. Not only did the authorities do nothing to prevent their abduction and consequent murder, but police reportedly directly attacked the youths. The students were handed over to local gangs and killed. In January, police arrested an alleged hit man for a local drug cartel in the case. The suspect, Felipe Rodriguez, belongs to the Guerrero Unidos cartel, and goes by the nicknames ‘The Brush’ and ‘The Stubborn One.’ He is believed by authorities to be the perpetrator of the mass killings that came to light after graves were discovered. Maria de los Angeles Pineda Villa, whose husband José Luis Abarca Velázquez was the mayor of Iguala when the students went missing, has been charged with organized crime and money laundering. She is being held in a maximum security prison until the start of her trial. According to prosecutors, members of the drug gang linked to Pineda confessed that the then mayor had ordered the police to crack down on the students to stop disrupting an event she was speaking at. In November, the former mayor was charged with organized crime, kidnapping and homicide for events that happened before the students disappeared. Their disappearance has caused mass protests in the country, with thousands demanding justice and rallying against corrupt police. 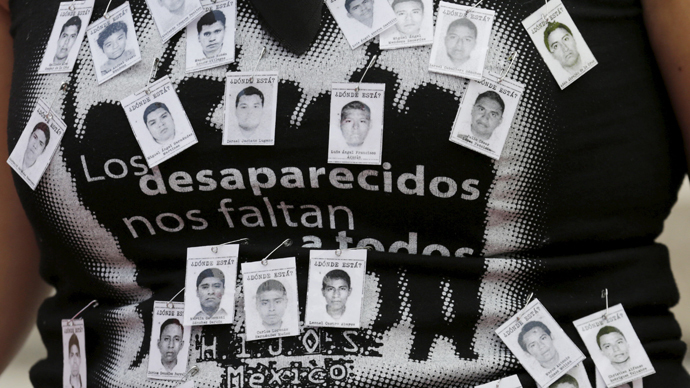 There has also been growing pressure on President Enrique Pena Nieto over the case. “With public officials complicit in drug cartel crimes, as well as thousands of torture cases of its own, President Peña Nieto needs to radically overhaul his country’s woeful response to this crisis,” Amnesty International UK’s Stop Torture campaign manager Tom Davies said last month.